The 1980's was particularly remembered for the fascinating rise of 30-minute advertisements for toys disguised as cartoons. But beyond merely being shown on television around the same time, the two franchises of G.I. Joe and The Transformers are a bit more memorable since the toys were manufactured by the same company. Over the years the Transformers brand has explored many different avenues of storytelling. One of the more interesting mediums that both the Transformers and G.I. Joe franchises have utilized rather heavily over the years is comic books - and more often than not they've shared the same comic book publisher. And that brings us to this interesting collection - a quirky depiction of what things would be like should the two fictional universes overlap. Crossover stories have always been a bit of a gimmick, but it's one that we've all come to enjoy to one extent or another. And this series of IDW Publishing collections gather the different crossover titles between G.I. Joe and Trasformers released over the years by those who previously held the license to create such stories in comic book form. Synopsis: G.I. 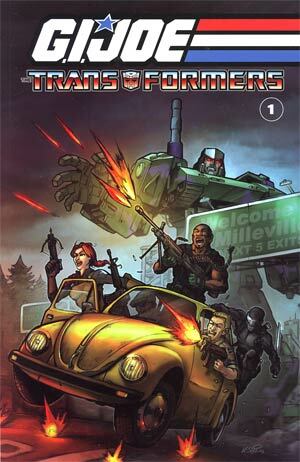 Joe/Transformers Volume 1 is the first of three comic book collections released by IDW Publishing. This volume reprints two different story arcs originally released by Marvel when they were responsible for the two franchises. The first part of this volume collects the 4-issue story of G.I. Joe and the Transformers. Here there's a new mobile nuclear power station at has been developed called Power Station Alpha. With this flying power source, it's able to beam its generated energy almost anywhere in the world, thus potentially solving a major part of what drives the energy crisis. Given its potential, both Cobra and the Decepticons desire to acquire the craft and eventually ally themselves together to achieve this end. The Autobots eventually cross paths with G.I. Joe, but it takes them a lot longer to learn to trust these alien robots and realize the real threat. The other part of this collection gathers issues 139-142 of A Real American Hero. This short arc helped kickstart what would become Transformers Generation 2 given it features the return of Megatron to the comic book world. In this case, he crosses paths with Cobra and eventually strikes a deal with Cobra Commander. In exchange for Cybetronian technology, Megatron expected Cobra to build him a new body with a particular weapon integrated into the design. This brings us Megatron's Generation 2 incarnation as a massive tank. The first story was classic Generation 1 writing. In other words, it was a highly wordy comic with decent but often inconsistent art but also with some strange character twists. And a lot of those complications were driven by the fact that they could not control the drastic changes going on in the main Transformers book - particularly the deaths of Optimus Prime and Megatron. But what was interesting as well was the fact that these crossover issues still affected the overall continuity of their parent titles. Thus you have things like Bumblebee becoming Goldbug and Serpentor taking over control of Cobra. Still, the way the two franchises came together for some pretty epic battles did make great entertainment. It remains a highly solid story that still manages to stand on its own two feet. The other story featuring Generation 2 Megatron will certainly go a long way towards filling that gap in the story towards the beginning of the Transformers Generation 2 comic. In those 12-issues, we just have Megatron suddenly reappearing in his new body and the few Autobots on Earth clearly decimated after a first encounter with him. These five issues, as set in the overlap of the G.I. Joe universe shows where Megatron got the notion to upgrade himself and make him all the more fearsome. Generation 2 Megatron was certainly a product of the 90's - he was wickedly violent with hard, jagged lines in terms of how he was drawn. He was more of a brute than ever and certainly push the limits of what we fans know of him as a character. And while his toy remains rather cumbersome in terms of design, it helped inspire a long line of Megatron incarnations that all play around with him being a tank. On the whole, G.I. Joe/Transformers Volume 1 is a great way to get your hands on these now hard-to-find Transformers stories. As reflective of the time they were published, both stories are rather wordy (in contrast to contemporary comics), and do require a bit more of an investment in reading time and focus. But I assure you it's worth it, and I don't just mean this from a fan-gushing perspective. Thus the collection rates a great 4 instances of Cobra or the Decepticons betraying one another out of a possible 5.